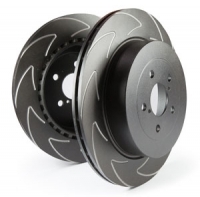 The BSD high carbon slotted rotors are available for both front and rear fitments, made in the UK. The uniquely created blade slot design helps to remove hot gases from the braking zone in a quick and efficient way much more so than a uni-directional slot. This helps to keep the pads flatter and the brakes cooler. The function of the multiple overlap slots is to reduce the wind noise, when braking.